Venezuela’s legitimate president, Nicolas Maduro, has lashed out at his Brazilian counterpart Jair Bolsonaro, calling him “Hitler’s imitator”, “a madman”, and “fascist”. Maduro slammed the Brazilian president’s recent threats about his country’s participating in a military intervention in Venezuela. Speaking to a crowd in the country’s capital Caracas, the embattled Venezuelan head of state said that after visiting the US and Israel, the Brazilian president had become "crazier than ever". "In the end, what is Bolsonaro? A fascist squab, Hitler’s squab, that's what Bolsonaro is, Hitler’s imitator, a crazy guy who came to the presidency”, he reportedly said. He questioned the reasoning behind Brazil’s possible intervention, saying that there have never been threats to invade a neighbouring country from a Brazilian president. He denounced Bolsonaro’s claims as a violation of the UN Charter, international and humanitarian laws as well as cooperation agreements between Brazil and Venezuela in effect for more than a century. "And I say, what is the cause of the war? Why will it invade us? Did Venezuela get involved with Brazil over anything? Is there anything Venezuela robbed Brazil of?" Maduro stated, also adding that the Venezuelan people categorically reject Bolsonaro’s threat of war and military invasion. According to Reuters’ reports earlier this week, Bolsonaro said that if there was a military invasion in Venezuela, he would ask the country's parliament if Brazil should join. The Brazilian president is said to have revealed, Brazil and the US are trying to sow dissent within Venezuela’s army. He also predicted guerrilla warfare waged by Maduro's diehard backers and whoever took power if any military intervention deposed Maduro. 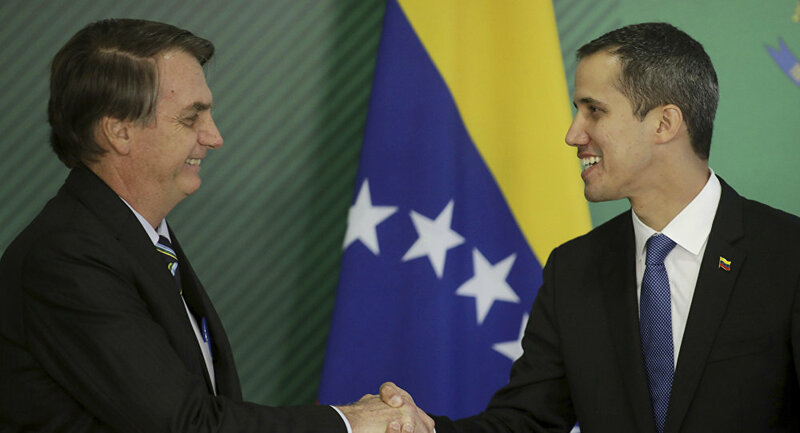 He thus echoed statements by the US as Brazil is heavily aligned with Trump on the Venezuela crisis, recognising self-proclaimed president Juan Guaido and vowing to "do everything possible to re-establish order, democracy, and freedom there", Bolsonaro said. Just recently, US Secretary of State Mike Pompeo spoke about Donald Trump’s unambiguity on the matter and confirmed that military intervention is still an option amid the ongoing political crisis, in which Washington has backed Guaido and denounced Nicolas Maduro.